IDF hits terror cells launching explosive balloons into Israel. The Israeli military said Saturday it launched airstrikes against two terror cells in Gaza, after they flew balloons rigged with explosives into Israel. 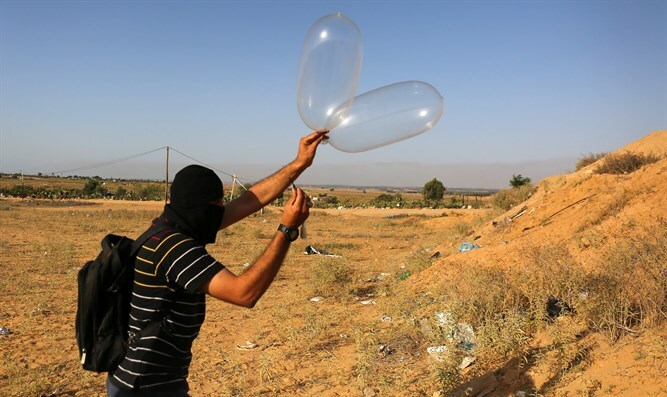 “Troops identified a terrorist squad which launched explosive balloons into Israeli territory from the southern Gaza Strip,” the IDF said in a statement. A subsequent statement said that an aircraft fired at “an additional terrorist squad” which also launched explosive balloons from southern Gaza. The military did not say if the targets were hit, but a Gaza security source said that two people were wounded in the first attack. He did not know the extent of their injuries. Gazans regularly launch kites and balloons carrying explosive or incendiary devices into neighboring Israel, causing extensive damage to farmland and private homes. Often, the deadly balloons are colorful and decorated with lights and toys, in order to entice young children into playing with them. At least one rocket-propelled grenade (RPG) was found attached to a balloon sent from Gaza. Israel and the Hamas terror group, which has controlled Gaza for over a decade, have fought three wars since 2008.